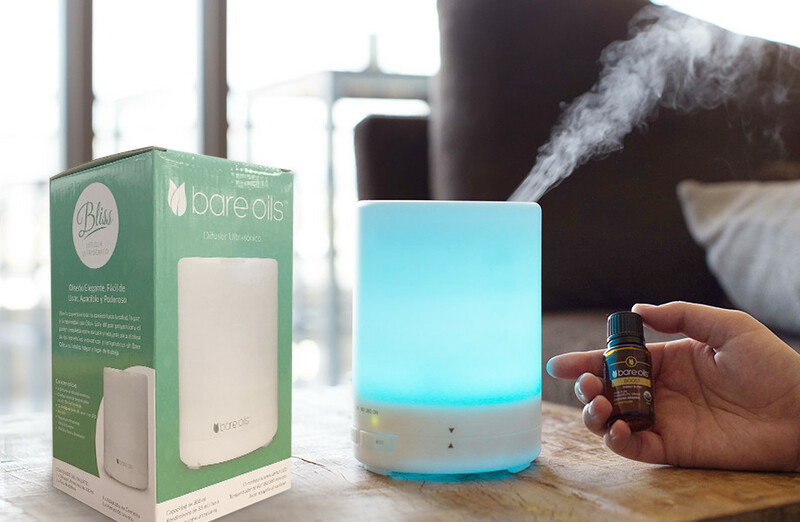 Experience the natural, soothing power of Bare Oils in your home or workplace by gently diffusing the oils into the air. Bliss Diffuser uses high-frequency ultrasonic electrical vibrations, which keeps the integrity of the oils pure and intact. To Turn Diffuser ON: Press and hold the “Mist” button for one second. Choose the timer: 60 mins, 180 mins, 360 mins, or ON. Light Control: Press the “Light” button to turn on LED light and color change feature. Press again for single light color selection. To turn OFF, press and hold the same button for one second. To ensure longevity, please maintain your diffuser. It’s necessary to maintain the diffuser every 5-6 usages or 2-3 days, or when changing essential oils. See package insert for more information. Keep out of reach of children and pets. Any misoperation caused by ignoring the manual precautions or instructions may damage the product or cause bodily harm. See package insert for more information.